The salmon is a little difficult to explain. We admit that up front. Basically what happened is that we were singing the Mr. Sandman song around the office, and it quickly mutated into us singing, “Mr Salmon, bring me a bream.” Over the course of a few days it became clear that Mr. Salmon could be a valuable member of the imaginary workforce at Molly Rocket. At that point, all that remained was for us to determine what his primary job function should be. This is, as a matter of practice, how we on-board new imaginary employees here. It’s a process we describe in detail in our upcoming sure-to-be-bestselling managerial book, Web 3.0: If the Profits Can Be Imaginary, Why Can’t the Employees? You’ll know it’s out when you see me and Anna on the cover of Wired. Since I wanted to write some blog posts about the history of “the mob” in preparation for 1935’s eventual release, we decided the most useful thing for Mr. Salmon to be was a history teacher. Unfortunately for you, the ostensible class, during sketching he developed into an extremely unforgiving pedagogue. As you can tell by his expression of disappointment, he thinks very little of your historical knowledge at present. To understand what “the mob” really is, you have to understand a bit of political science. But just a little bit. Only the teeniest, tiniest bit. And that bit is the definition of “sovereignty”. So the folks who study things like the formation of nations and the historical origins of power and all that good stuff have a much more precise way of defining “sovereignty”. It’s rooted in that time-tested, ever-popular, sure-fire method by which humans have always resolved their differences: violence. The key here is that word “legitimate”. If someone were to take you and lock you in a room, regardless of their reason for doing so, we’d call that act “kidnapping”, the person would be considered a “criminal”, and you a “victim”. But if the government takes you and locks you in a room, we call that act “enforcing the law” and that person is an “officer of the state” who took you to “prison”. What’s more, you are now presumed to be the criminal — exactly the opposite of the first scenario! It’s the same physical activity, but depending on who has the legitimate claim to using force, we view these things very differently. It’s a powerful unifying principle. Everything else comes out of it. We made laws so we could agree on how legitimate force should be applied. We have taxes so we could fund the structures necessary to administer said monopoly. We have borders because we need to know where one monopoly ends and another begins. We have political systems (dictatorship, monarchy, democracy, etc.) because we’re looking for good ways of figuring out who is in control of the monopoly. “The mob” is what you get when the public government loses its monopoly on legitimate force to a private entity. Perhaps that sounds too simple, but that’s what it boils down to. When a criminal organization becomes so enmeshed in a society so as to effectively become a second sovereign whose use of violence is no longer questioned, that’s what we normally think of as “the mob” (or “the mafia”). The analogy of the mob to a state runs surprisingly deep. At their apex, these institutions of organized crime have most of the typical parts you might associate with a traditional state: they collect taxes (“protection money”, or “pizzo” in the traditional Italian), divide control into districts, have a hierarchical command structure, and even have assemblies that meet to adjudicate matters of common interest. So for the people who live in a region controlled by the mob, they are effectively living under two sovereigns: their city government and their mob government. They must pay the taxes imposed by both and follow the rules laid down by both. And unfortunately, since the whole point here is that this has become legitimized, there’s very little anyone can do about it. You can’t exactly report the mob to “the authorities” because as far as anyone is concerned, they are on equal footing. But there’s a ton of specifics: how does this sort of thing actually come about in practice? How is it ever undone? And specifically for our game, who were the acting “sovereigns” in New York City in 1935, and how did they operate? All of these questions have very interesting answers, and we’ll be getting to all of them on this blog over the next few weeks. 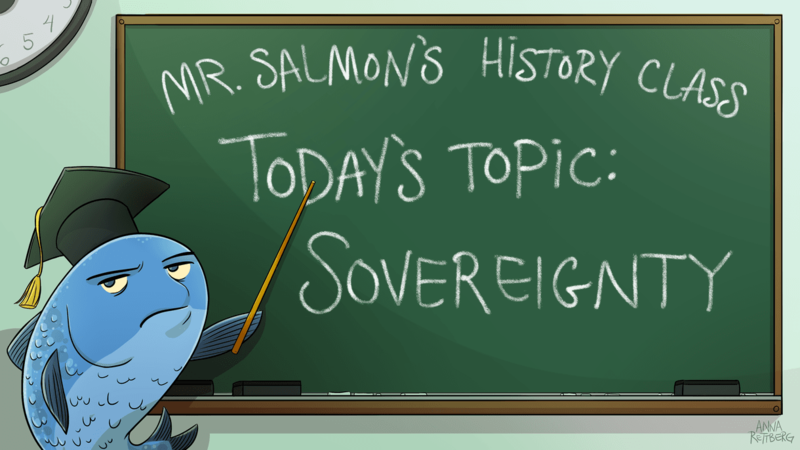 Mr. Salmon wouldn’t have it any other way!